Photos by Fred Donham of PhotographerLink, photographerlink.com. It takes imagination, skill and hard work to turn an empty canvas into a dream outdoor space. 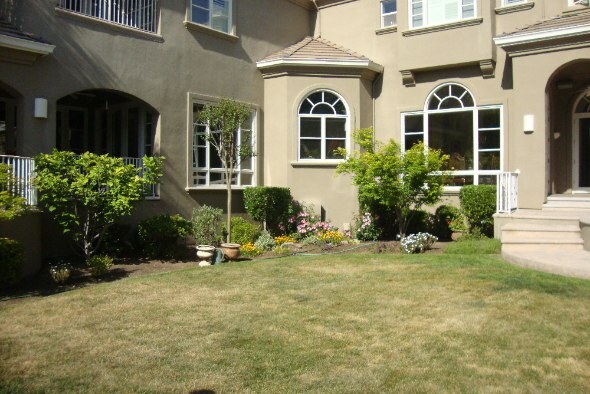 But that’s exactly what Favian Mercado, of Mercado Construction & Design, Inc. in Folsom, accomplished for his clients. 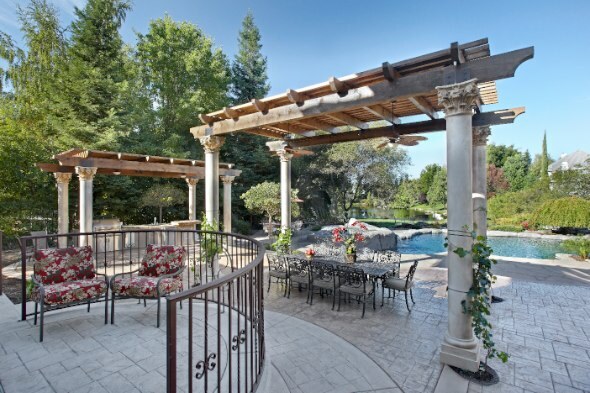 Beginning with a large grassy lawn and the architect’s plans, he expanded this Granite Bay home’s outdoor living area, making it more accessible for entertaining and enjoyment of the surroundings. The clients found Mercado through a magazine advertisement for his business. Though they interviewed several contractors in their search, they ultimately selected his company to take on the ambitious project. After evaluating the design provided by the architect, Mercado and his team were able to redesign a better layout, one that not only lowered the overall cost of the project, but also met the clients’ needs. The first order of business was expansion of the yard. They accomplished this with a foundation of colored, stamped concrete that began at the foot of the home’s exterior and continued all the way down a gentle slope to the pool area. To create independent spaces for outdoor entertaining, they built two oversized wood trellises, each framing an outdoor dining area and kitchen. The trellises received a romantic, Old World treatment with ornate pre-cast columns, each with accent lighting, ceiling fans, mister systems for hot summer days, and patio bra covers for added protection. The outdoor kitchen addition included a built-in grill with halogen lights and a digital thermometer, ice maker, refrigerator, sink and faucet, stainless steel storage drawers and countertops with a raised bar area. Though the original project was estimated at $65,000, the budget was expanded at the clients’ request to accommodate more features. The addition of another covered trellis structure and the final outdoor kitchen brought in an additional cost of $32,000. In the end, the project totaled out at $97,000 and took four months to complete. Was it worth the expense and time commitment? The results surely speak for themselves. Not only were the clients pleased with the final project, but it also met their needs and expectations. Now they can look forward to many warm, fun-filled summer nights in their beautiful outdoor living space.